Wild animals are the most common victims of fake sanctuaries which perpetuate the cruel exotic pet trade and exploit wildlife for profit. As animal advocates are increasingly boycotting zoos due to the unnecessary confinement and inhumane treatment of imprisoned wildlife, more people are seeking compassionate alternatives. Many well-intentioned animal lovers are unknowingly visiting exploitative animal attractions that masquerade as animal sanctuaries. Wild animals are the most common victims of fake sanctuaries which perpetuate the cruel exotic pet trade and exploit wildlife for profit. Before visiting any facility housing captive wild animals, ask yourself these five questions to avoid supporting a cruel and deceptive attraction. If animals are trained to perform tricks, it is not a legitimate sanctuary. Training wild animals commonly involves violent practices including whips, electric shocks, and food deprivation. Animal sanctuaries exist for the welfare of animals, not the entertainment of humans. No true sanctuary will force animals to perform, as this is never in the best interest of the animals. Are you allowed to take photos with wild animals? Reputable sanctuaries do not allow visitors to physically interact with wild animals. If a facility offers hands-on contact with wildlife—including taking photos with animals—it is a sure sign that it is not an animal rescue. At legitimate sanctuaries, even the animal caregivers avoid physical contact with wildlife unless absolutely necessary. Captive wild animals deserve to live as close to their natural conditions as possible. Playing or taking photos with a wild animal is never in alignment with that animal’s welfare. A common sign of an exploitative animal attraction is the consistent presence of baby animals (if possible, look for photos of the attraction’s animals online prior to visiting—if babies are prevalent, this is a red flag). Sanctuaries do not breed animals, with the rare exception of facilities with reintroduction breeding programs which are almost never open to the public. Fake sanctuaries breed captive wildlife to draw visitors and maximize profit. While they often irrationally claim to breed animals for conservation purposes, animals bred at these facilities are never introduced into the wild. 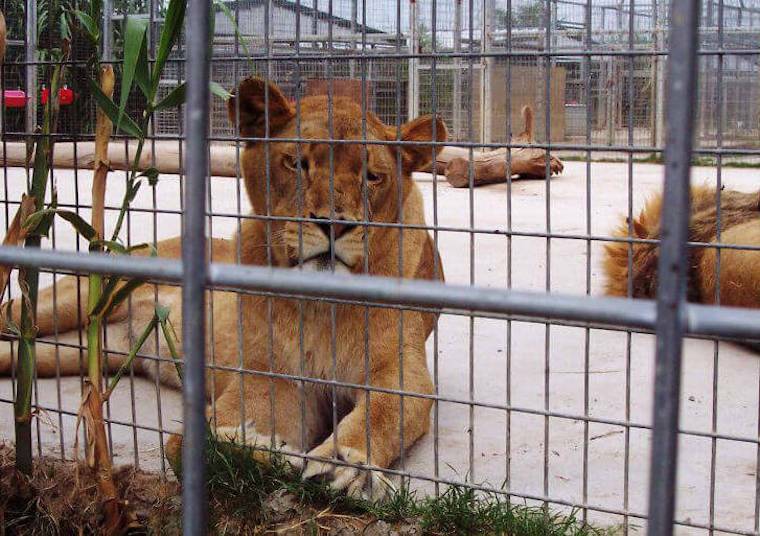 Are animals kept in inadequate enclosures? Enclosures should be expansive and offer stimulation and enrichment. Animals should have enough room to exercise instinctive behaviors comfortably and the environment should replicate the species’ natural habitat. Sham sanctuaries often house animals in cramped concrete enclosures devoid of any meaningful enrichment. This is extremely detrimental to the wellbeing of captive wildlife and antithetical to the purpose of animal rescues. Psuedo sanctuaries frequently tout that they are USDA-accredited—but this is far from adequate. Animal care is poorly regulated and the USDA permits captive wildlife to be housed in extremely poor conditions. To check whether a sanctuary has reputable accreditation, visit the Global Federation of Animal Sanctuaries. The GFAS has a thorough evaluation process and only approves sanctuaries and rescue centers that provide optimal care for animals. They do not allow captive breeding programs, unsupervised tours, or public contact with wildlife, and approved organizations must adhere to strict animal care standards. If you answered “yes” to any of the above questions, do not support the attraction or fall victim to fabrications from animal exploiters about sham rescue stories and meaningless accreditations. Thankfully, awareness is growing about the plight of exploited wildlife. This week, Instagram made headlines for a policy that brings attention to the cruelty behind wild animal selfies. Additionally, dating app Tinder recently condemned profile photos with tigers, which were alarmingly common on the app. Take a stand for animals and create meaningful change for captive wildlife by refusing to patronize cruel attractions and educating others about the reality of fraudulent sanctuaries.